Israeli-born Yotam Ottolenghi trained at Le Cordon Bleu in London. He then worked at the Michelin starred restaurant The Capital and later in the pastry section of the Kensington Place restaurant. He went on to become head pastry chef at Baker and Spice in Chelsea, where he met his Palestinian life partner Sami Tamimi. In 2002 their first delicatessen opened in Notting Hill. They have since opened three more establishments, selling some of the best takeaway food in London. Together Yotam and Sami have also co-authored several cook books. Their culinary style is bold and often influenced by Middle Eastern flavours. This scrumptious salad comes from their book Jerusalem and came highly recommended by my daughter Catherine. The pan fried pita croutons idea is one you can use in other salads. You could do them with or without the nuts and use walnuts, pecans, pine nuts or macadamias to ring the changes. You could also use halved raisins if you don’t have any dates. Place vinegar, onion and dates in a small bowl, add a pinch of salt and mix well. Leave to marinate for 20 mins then drain off any remaining vinegar and discard. Heat butter and half the oil in a medium frying pan. Add pita and almonds and cook, stirring all the time, for 4-6 mins over medium heat until golden. Watch carefully the nuts don’t burn. Remove from heat and mix in the sumac, chilli and ¼ tsp salt. 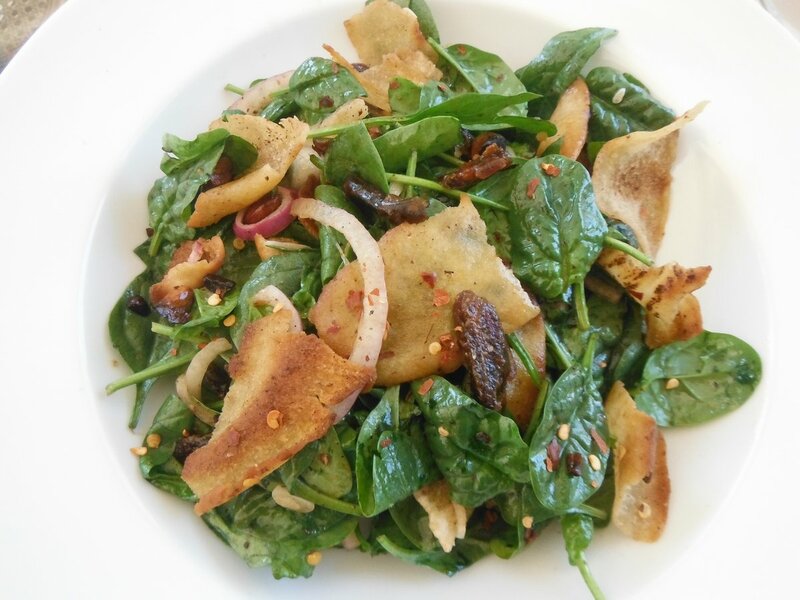 To serve, mix spinach leaves with the pita and almonds. Add the dates and red onion, the remaining Tbs of oil, lemon juice to taste and another pinch of salt. Taste for seasoning and serve immediately in one large salad bowl or on individual plates. Note: Sumac is a Middle Eastern ground spice available in ethnic markets and gourmet grocers. This entry was posted in Recipes and tagged bbq, easy, family, lunch, quick, spinach, summer, vegetables, vegetarian by Linda Peek. Bookmark the permalink.